Southampton People’s Budget, have your say! What do you want from Southampton Council? Come and have your say! Come and meet other anti-cuts campaigners and trade unionists in Southampton. Come and hear from anti-cuts councillor Keith Morrell what councils can do to stop the cuts. Hear from national president, Sean Hoyle, of the transport union RMT what unions are doing to oppose the cuts. In the face of 5 years of cuts to local government funding by the Tory government, council services have been decimated with the loss of hundreds of council jobs. Over 15 000 people are on the council house waiting list. Poverty pay, the bedroom tax, benefit cuts and sanctions means a struggle to eat, with hundreds of families using food banks. Youth services have closed. The NHS Walk-Ins in Bitterne and Shirley have been closed. Care homes for the elderly, like Woodside Lodge have been closed. Now libraries are under threat with funding cut to Burgess, Cobbett Road, Millbrook, Thornhill, Weston and the mobile library. We say enough is enough. Southampton Labour Council alongside other Labour councils across the country must refuse to carry out further cuts; use reserves and borrowing powers to protect all jobs and services, and campaign for the government to restore the £90 million stolen from the city since 2010. Such a stand would receive enormous support. If the council set a people’s budget based on the needs of the city, rather than carry out further cuts, a mass campaign of council workers, their trade unions and the community could massive pressure on the government to fund local services. The Tory government is weak and divided. It has been forced to u-turn on planned cuts to tax credits. It can be forced back over council cuts. While cuts have been made to council funding, tax cuts have been given to big business and the supper rich. Austerity is a political choice. Austerity is planned poverty. The election of Jeremy Corbyn, unapologetically anti-austerity, has given hope to millions that the cuts can be stopped. If Jeremy and the Labour Party gave its backing for Labour councils to take a stand with the support of trade unions like UNITE and UNISON, pledged an incoming Labour government would reimburse all local authorities who used reserves and borrowing to protect jobs and services, then the attacks on local council services could be stopped and reversed. 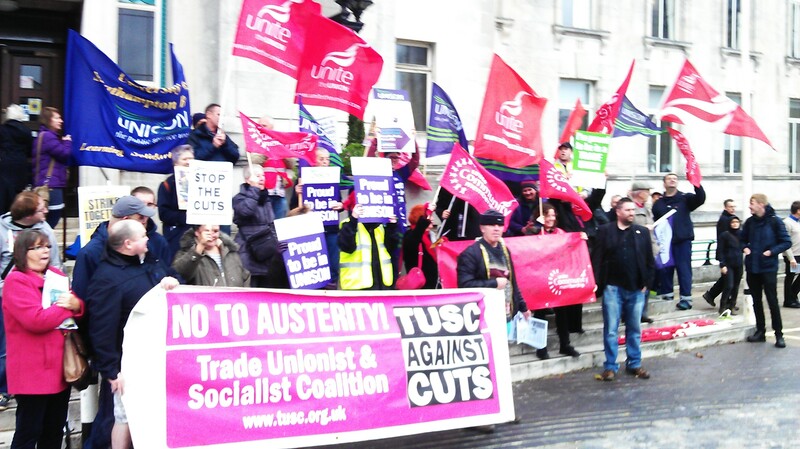 Southampton TUSC is committed to that fight, come and join us! A BUDGET TO MEET THE NEEDS OF THE CITY. A BUDGET TO FIGHT FOR! Saturday 9 January 2pm, Meon Suite, James Matthews Building, Guildhall Square, Southampton. All welcome, full access. What is a people’s budget? It is a budget that is set to meet the genuine needs of the people who live and work in the city. It bases itself on the belief that Sotonians as service users, local authority or private sector workers and their trade unions, community groups or individuals, know about how to maintain and improve jobs and services. It is an alternative to the austerity driven agenda of the Tory government. Sounds interesting, how would it work? As a first step we want people to come together to talk about the current state of services in the city and what we need. From this the council could set a budget based on those needs, not driven by austerity. Support across the city can then be built to demand the government restores funding to deliver the services we need. Cuts are hugely unpopular, a People’s Budget would gain enormous support. This would then be costed and presented as an alternative to the cuts being proposed by the other parties. I don’t like services being cut but haven’t the council tried everything already? Every year local politicians ram down our throats the idea that austerity and cuts are the only option. 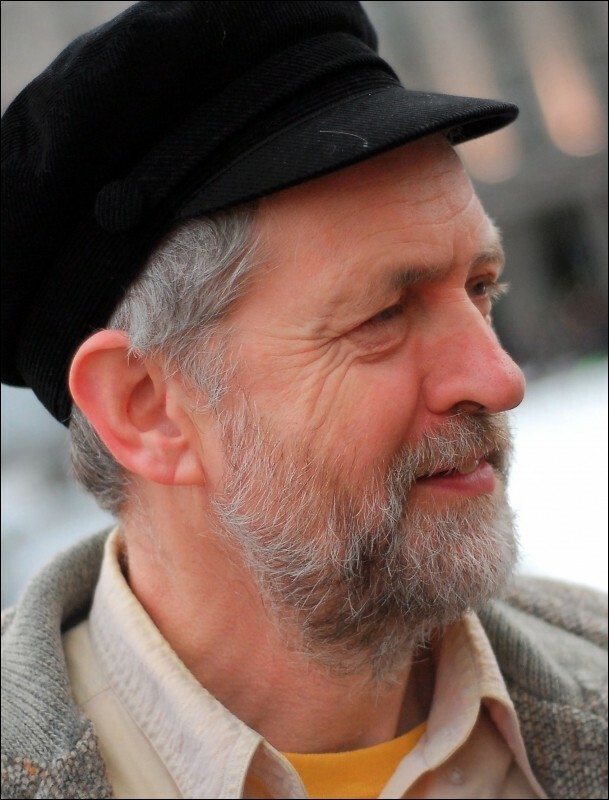 The election of Jeremy Corbyn in September shows that there is genuine interest and support for a different approach. He has said that cuts are unnecessary and do not need to be made. We agree and call upon Southampton Labour led city council to adopt this idea. We can’t spend money we don’t have can we? Local councils have financial reserves and specific borrowing powers to enable them to fund a budget that would improve lives instead of ruining them. Southampton Labour Council must use these powers to set a legal, balanced, no cuts budget. Such a stand would gain massive support and force the government to restore council funding to the city. Jeremy Corbyn must back such a stand and give a commitment that a future Labour government would restore any money borrowed to protect jobs and services. The Trade Unionist & Socialist Coalition opposes all cuts to jobs and services and calls on Labour councils and councillors to refuse to implement Tory cuts. TUSC was launched in 2010 by transport trade union leader Bob Crow. In Southampton we support Coxford Councillors Keith Morrell and Don Thomas, Councillors Against Cuts. 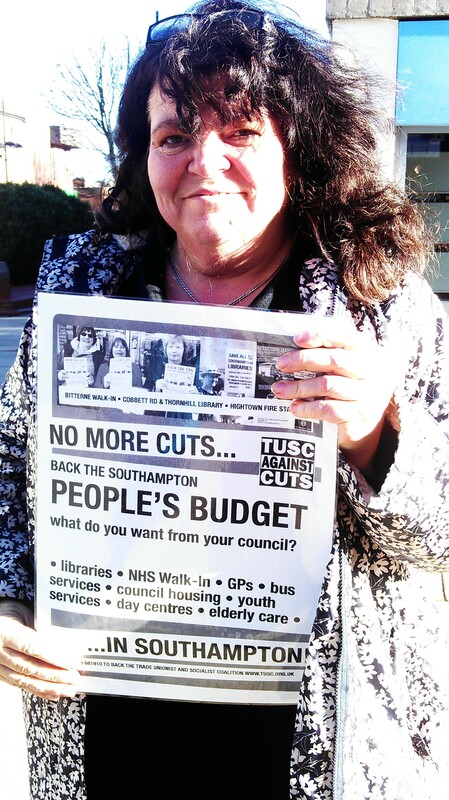 Southampton Trade Unionist and Socialist Coalition (TUSC) have launched a consultation for a People’s Budget for the city, in contrast to the new round of cuts being proposed by the Labour-led council. A questionnaire has been produced (clickhttp://www.tusc.org.uk/txt/351.pdf) for community groups, local trade unions and Southampton residents generally to say what they would like the council to do to improve life in the city. Respondents are also asked whether they would support Southampton Labour council refusing to carry out further cuts; whether they think the council should use its reserves and borrowing powers to protect jobs and services; and whether they would actively support a campaign to restore government funding to Southampton. 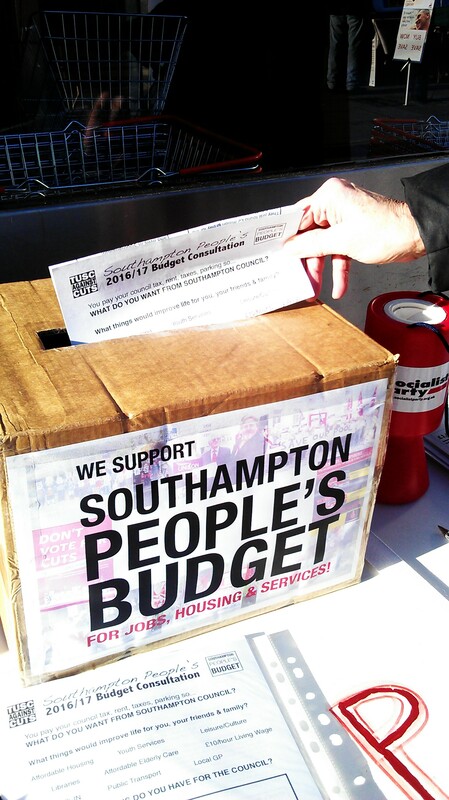 The first results of the survey will be discussed at a Southampton People’s Budget Conference on Saturday 9 January, 2pm, Meon Suite, James Matthews Building, Guildhall Square, Southampton. 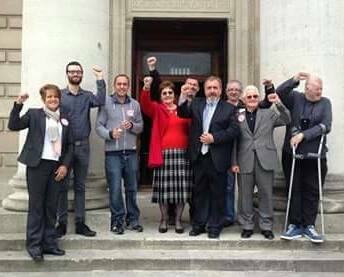 At the most recent Southampton council meeting on 18 November the Labour Group presented a resolution opposing the government’s Trade Union Bill attacking the rights of workers to organise effectively to defend their jobs, terms and conditions. But it also discussed the new round of cuts it is planning to make to Southampton’s local public services. Consequently Southampton’s two rebel anti-cuts councillors Don Thomas and Keith Morrell (a member of the TUSC national steering committee), while backing the Labour Group’s motion against the Trade Union Bill, called for the council to further support working class people by not implementing cuts to council services. “We see this motion with our amendment to it as an opportunity for this Labour council to act in accordance with Jeremy Corbyn’s leadership campaign pledge to start a real fight-back against the government’s austerity agenda. “When Jeremy Corbyn came down to the Ageas Bowl in the summer and spoke to over a thousand Labour Party members and supporters he said very clearly ‘cuts to services must stop’. “And as councillor McEwing rightly said on the very same stage, ‘the fight-back starts now’. Cathy is someone I think highly of and I could not agree more. “It is good the Labour Group are taking up the trade union cause, and of course we showed full support for that. “But here’s the rub. Will you now – the Labour Group – do the same by taking up the cause for our Southampton residents, and our council staff? “This amendment would start that process, by saying we will not close down any more facilities or lay off any more staff. “Make no mistake. Rather than being thrown out of office next May residents will thank you, and will show their appreciation through the ballot box. “Leader of the Council [Simon Letts], you have said on at least one public occasion – I believe it was at the Overview and Scrutiny committee – that you were nearing the point of throwing the keys back to the government because you were running out of things to cut. “Can I suggest Simon, rather than contemplating handing the keys back, that you follow your leader Jeremy Corbyn’s stance and start a fight-back? Right here, right now, in Southampton. “We are the fifth richest country on the planet. When the government needed to find the money for the bankers there was absolutely no problem. “I’m sure that no one in the Labour Group came into politics to carry out this government’s dirty work, with cuts after cuts after cuts, year after year. I was in the Labour Party myself for thirty plus years, this tells me that must be so. “And if anyone in the Labour Group believes that they still have ‘no choice’ then I say you must ask yourself, what are you doing being in politics? “As your very own Labour shadow chancellor John McDonnell has said, ‘austerity is a political choice’. Never has a truer word been spoken”. Southampton council meets on 18 November in the next round of council budget consultations. Trade Unionist and Socialist Coalition (TUSC) supporters will be lobbying the council to defend jobs and services and back Jeremy Corbyn’s call to stop cuts. Services currently under threat include six libraries in the city. Just £250,000 would keep them open and protect librarians’ jobs. NHS walk-in services in Bitterne have recently closed, despite a five-year long TUSC campaign. Just £120,000 would fund the nursing staff to re-open services there. While these essential services suffer, Southampton council has found £2 million to complete its corporate arts centre project, now home to a new Nandos restaurant. The council actually held £19.9 million in its ‘General Fund reserves’ at the end of the 2014-2015 financial year. It also has £62.8 million in ‘earmarked GF reserves’ which, however, can still be used to support services. Councillors make choices – why can’t they find the money for the libraries and walk-in services? Over £90 million cuts have been carried through since 2010 in Southampton, devastating jobs and services. After winning a majority on the council in the 2012 local elections, Labour has continued voting though Tory cuts and losing council seats along the way, while anti-cuts councillors Don Thomas and Keith Morrell (a member of the TUSC national steering committee) have been re-elected with huge majorities. The election of Jeremy Corbyn has boosted support for the anti-austerity movement. During the Labour leadership he spoke in Southampton to close to a thousand people who cheered his call to end council cuts. To build support for such a stand TUSC is organising a Southampton People’s Budget conference to identify what the city needs and how we can fight for it. The Trade Unionist and Socialist Coalition (TUSC) national chairperson Dave Nellist has warmly welcomed Jeremy Corbyn’s decisive victory in the Labour leadership contest. “Jeremy’s clear victory will now give a voice to the depth of anti-austerity feeling in Britain. He has clearly inspired huge numbers, particularly young people, with his call for free education, public ownership of rail and energy, and for councils to stand together in opposition to government cuts. “TUSC will host the first national left-wing meeting to discuss the new situation in two weeks’ time [on September 26th]. I’m sure that meeting will welcome Jeremy’s victory, but in reality it’s just the first step. “The TUSC conference will be making plans to write to every Labour candidate standing in next May’s elections to ask for a meeting with them to see how much they are prepared to back their new leader’s anti-austerity stance. In particular we will be asking Labour candidates if they agree with us that Labour councils should now combine together and refuse to implement the Tories’ brutal austerity agenda. “Where we get a positive answer from Labour councillors or candidates we look forward to the possibilities of joint action against austerity. “Where, however, Labour councillors or candidates are not prepared to follow Jeremy’s stance in opposing George Osborne’s austerity agenda, then TUSC will stand widely in the May 2016 elections in England, Wales and Scotland”. Text for a model letter agreed by the TUSC national steering committee, which local TUSC groups can use to approach Labour council candidates, is available athttp://www.tusc.org.uk/17116/12-09-2015/model-letter-to-labour-councillors . A call for an end to austerity, from Jeremy Corbyn speaking in Southampton on 25 August, was met with a standing ovation and cheers from a near 1,000-strong audience. They were enthused by his unapologetic attack on austerity. Once again the huge turnout nailed the lie that there is no support for an alternative to austerity or a willingness to fight back. Corbyn’s calls for a £10 an hour minimum wage, affordable council housing and an end to cuts to local government were met with cheers. In a limited discussion he gave backing to calls from the floor for opposition to fracking and support for council care homes and free national childcare. The demand to defend local government and provide funding and borrowing powers for councils to tackle the housing crisis raises questions of what Labour councils and especially councillors who are backing Corbyn’s campaign, should do to stop the cuts. Southampton Labour councillor Cathy McEwing, speaking from the platform, said the fightback had to start now. This is in the face of further cuts to council services in Southampton of £40 million in next year’s budget. What should councillors do to build this fight back? Does this mean that councillor McEwing and others supporting Corbyn will now refuse to vote for further cuts? Opposition to cuts must include mobilising support in the trade unions and community to set needs-based budgets. If they do, Socialist Party members will give our full support, to build on the successful stand and re-election of Southampton Councillors Against Cuts, Keith Morrell and Don Thomas. However last week, councillor McEwing and the Southampton Labour cabinet voted through £9 million of cuts, including cutting funding to five libraries. If this continues, Labour will continue to lose support and open the possibility of a return of the Tory council which was defeated by the strike action of council workers in 2011. This support for Corbyn must be translated into a call for Labour councils to refuse to implement further cuts. However, those councillors who continue to say there is nothing they can do, who continue to vote for cuts, will need to be challenged again by anti-cuts candidates standing as part of the Trade Unionist and Socialist Coalition. Anti-Cuts Councillor Don Thomas wins 1000 vote majority! Congratulations to Don Thomas, re-elected as Coxford anti-cuts councillor by close to 1000 vote majority. He rejoins his anti-cuts councillor Keith Morrell to continue to the fight against austerity and put an alternative forward on Southampton City Council to the axe-wielding Labour council. 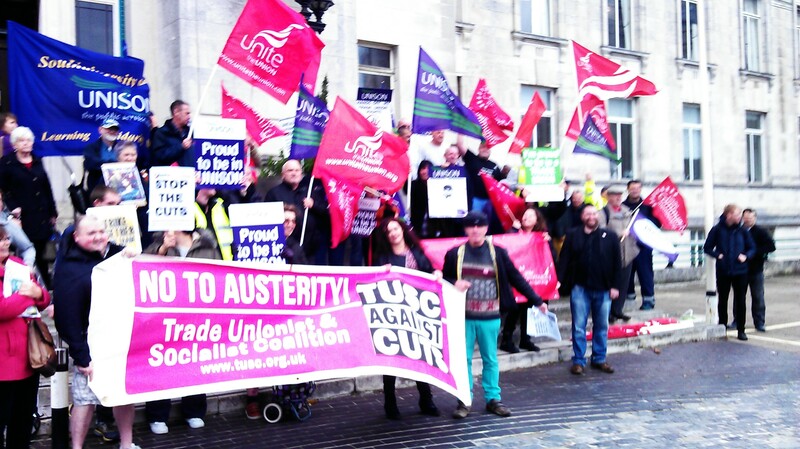 Southampton TUSC gave its active support to Don’d campaign as well as standing across the city in council and Westminster elections. Celebrating outside the count with Don & Keith! The Trade Unionist and Socialist Coalition (TUSC) national steering committee held its first post-election meeting this week. Against the backdrop of a Tory-majority government committed to accelerated austerity, albeit one with the lowest ever share of support amongst the total electorate (24.4%), the need the build on the TUSC campaign to develop a socialist electoral alternative was recognised by all at the Trade Unionist and Socialist Coalition (TUSC) post-election national steering committee. The meeting agreed a vote of thanks to all the 748 candidates – and their agents and campaign teams – who contested the elections on May 7th under the TUSC umbrella, polling a combined total of 118,125 votes.